Thank you very much for visiting my listing . This accommodation used to be the traditional 2 floors house of my grand parents which i have just renovated to 2 big apartments this year . If you are looking for a real , local Greek experience this is your place to stay . The apartment is an independent private residence. Our guests are mostly adventurer travellers and families who seek for genuine experiences and want to blend in with the local culture . Located in the heart of the traditional settlement of Fira Capital ,this apartment has 2 separate rooms and can host up to 4 persons . The main bedroom has a king size double bed , television , mini hi fi with CD - AUX - USB player . If you are more than 2 guests you can use a big sofa in the second room which can be easily transformed to a normal big size double bed .An extra bed can also be provided . That will give you the opportunity to visit with your friends or family without having to split in 2 different properties .Meaning , you can all share the costs as a place for 4 guests is much cheaper than 2 typical double rooms in a Hotel . The kitchen is fully equipped with Big Oven , Microwave and Large Refrigerator . The veranda is big with beds to sunbath and a table with chairs to eat outside . Wi - Fi fast internet connection is also available .. Most hot spots of Santorini are at minimum distance : Night clubs , Museums , Markets etc.. You 'll enjoy this place , i am sure !! My name is Manolis Sigalas and I was born and raised in Pireaus and Athens . i came to Santorini 1998 and i run an I.T. company . I am also in the business of events engineering . I make events for live concerts - wedding parties and music festivals . i leave in Santorini 11 months / year . i advise this property for people who want to feel like home wherever they travel in the world . If you are looking for a a kind of a typical hotel accommodation service this place is not for you . In this apartment you will wake up by the bright sun shining from the big east window , cook a breakfast with fresh local products you bought from the grocery shop next door and set off for your adventure in Santorini . Come back after sunset take a nice hot shower and make a nice meal or cocktail to stay in the veranda or get prepared to go out for a romantic dinner or party untill morning . This apartment is one among the really few lodgings that exist in Fira town central and can give a ''like home'' feeling to your stay away from big hotel blocks. Furthermore , this apartment can host up to 4 people . That gives you the opportunity to visit with your friends or family without having to split in 2 different properties . Also , you can all share the costs as this place is for 4 guests is much cheaper than 2 typical double rooms in a Hotel . The kitchen is fully equipped with Big Oven , cooktop , Microwave , coffee maker and Large Refrigerator . the veranda is overlooking the east side of the island and the aegean sea . It is fully sunny for the entire day time . Great location. Every morning we hear the jingling of the donkeys on their way to the caldera. Nice apartment and Manolis was very helpful. And Santorini really is a dream island. Manolis was very easy to communicate with before the visit, and we loved his place. Great location in the middle of Fira, and comfortably fit the 4 of us. Would definitely recommend! Stayed in this property for two nights. The property was spacious, clean and comfortable, and well equiped for proper cooking if you have the energy to do so. We didn't use the cooking facility as the local food was too nice to be bothered to do so. Ladokolla is the best restuarant we went to in case you are looking for one. We were particularly thankful to the landlord's extra help throughout the room reservation and stay. I initially booked for two nights but needed to change to two nights later. The system didn't give me the option to do so and the landlord did it for me. However, the price charged by the system didn't reflect the change of the booking. The landlord acted in a very honest way and refunded me all the difference through the system and by cash again due to the limit of the booking system. Nice apartment with short walk to the Caldera. The apartment was a nice 1 bedroom with a sofabed, which we used for our third person. We were there in the offseason, but the location would be away from the crowds. Manolis was easy to contact, and quick to respond. He left some sweets for our arrival. We enjoyed staying here, and would stay there again. Manolis was amazingly helpful from start to finish. He met our cab from the ferry at the Penguin Laundry in Fira and arranged for private transport to the airport. His grandparents' house is renovated, well furnished and quiet! The only "noise" was the lovely sound of donkeys hoves on the cobblestones twice a day coming and gong to "work" transporting tourists up the caldera from the port. The apartment is an easy walk to the city center, bus to Oia, museums, shops, restaurants and our every evening sunset viewing. Most importantly, Manolis is the epitome of Greek hospitality and warmth---he goes out of his way to answer your questions and provide you with whatever information you ask for. You are truly a guest in his home (although he lives elsewhere), of which he is justifiably proud. Quiet place near the heart of the city! Nice clean apartment! 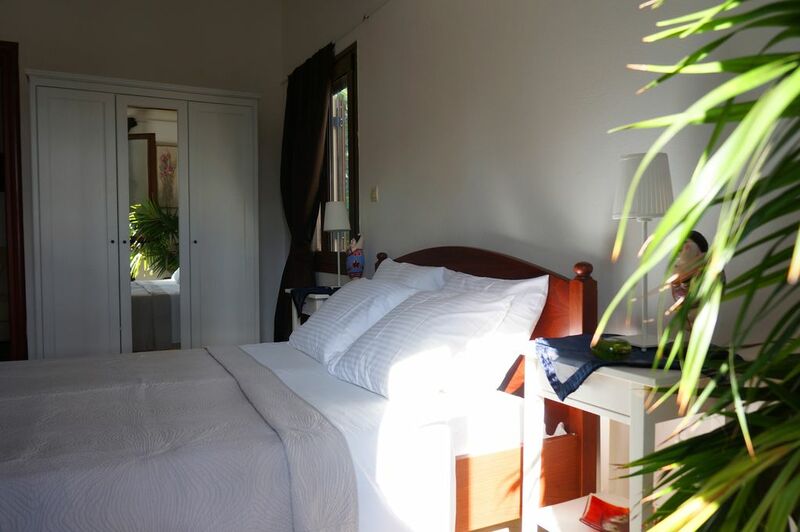 Walking distance to the caldera and the town square. My apartment is located at the heart of famous Fira Town Santorini. Travel agencies - Car rentals - Excursion - Yacht offices : 2min.